Current studies focus on investigating the genetic defects associated with familial essential thrombocythemia and myelodysplastic syndrome. These data have been enormously helpful in carrier testing and prenatal diagnoses in affected families and have given insight into the basic biology of disease which will hopefully guide therapy development. X-chromosome inactivation (XCI) is a mechanism occurring in females in which one X in every cell becomes inactivated. This is a form of dosage compensation thought to equalize the genetic dosage between males and females (who have one and two Xs respectively). The choice of which X is inactivated has traditionally been viewed as occurring randomly and independently in each cell. There is evidence, however, that the choice step of XCI is genetically influenced. One argument in favor of a genetically influenced model is that skewed XCI, that is, XCI that results in a ratio that is significantly different from 50:50 appears to cluster in families. One such family has presented with several females affected with HA. Analysis showed that most of their cells were expressing the mutated X chromosome. It is unlikely that chance could account for the dramatic skewing of XCI leading to 3 affected females. This led Dr. Greer and her team to consider that they have inherited a predisposition to skewed XCI patterns. Their work has shown that there is genetic control and a gene, STAG2, is likely associated with skewed X inactivation and therefore the expression of hemophilia A in females in this family. This work has led to a better understanding of HA in female carriers. Because XCI can be skewed to varying degrees, it is reasonable to expect that females might express HA accordingly. We conducted an interview survey of HA carriers who reported varying bleeding symptoms. They also reported that their bleeding concerns were often dismissed by health care professionals. A larger questionnaire follow-up study is underway. As director of the DNA diagnostic laboratory at NSHA, Dr. Greer's lab offers a clinical diagnostic service to identify known genetic markers that help to diagnose, prognosticate and in some cases, guide therapies for cancer patients. Studies assessing the frequency of specific markers in our population are underway. Newman, W.G., Zhang, Q., Liu, X., , E., Ternan, H., Owen, J., Johnson, B., Greer, W.L., Mosher, D.P., Maksymowych, W.P., Bykerk, V.P., Keystone, E.C., Amos, C.I., Siminovitch, K.A. (2006). Rheumatoid arthritis association with the FCRL3-169C polymorphism is retricted to PTPN22 1858T-homozygous individuals in a Canadian population. Arthritis Rheum. 54(12):3820-3827. Foote, C.J., Greer, W.L., Kiberd, B.A., Fraser, A., Lawen, J., Nashan, B., Belitsky, P. (2006). MDR1 C3435T polymorphisms correlate with cyclosporine levels in denovo renal recipients. Transplant Proc. ; 38(9):2847-9. Foote, C.J., Greer, W.L., Kiberd, B., Fraser, A., Lawen, J., Nashan, B., Belitsky, P. (2007). Polymorphisms of Multidrug Resistance Gene and Cyclosporine Absorption in De Novo Renal transplant Patients. Transplantation. 83:1380-1384. Zayed, A., Couban, S., Hayne, O., Sparavalo, N., Lee, C., Sadek, , Shawwa, A, Greer, W.L., (2007). Acute Promyelocytic Leukemia: A novel PML/RAR alpha fusion that generates a frameshift in the RAR alpha transcript and ATRA resistance. Leukemia and Lymphoma. 48:489-496. Tatlidil, C., Parkhill, W.S., , Greer, W.L., Morris, S.F., and Walsh, N.M.G. (2007). Detection of tyosinase mRNA in the sentinel lymph nodes of melanoma patients is not a predictor of short term disease recurrence. Modern Pathology. 20:427-434. Dyack, S., Cameron, M., Otley, A., and Greer, W.L. An Autosomal Recessive form of Alagille-like Syndrome that is not linked to JAG 1. (2007) Genetics in Medicine, 9: 544-550. Berman, JN., Greer,WL., Loh, M., Riddell DC., Morash, BA, Dumas, N., Fernandez, CV., and Ludman, M. JAK2 V617F positive polycythemia vera in a child with Neurofibromatosis Type 1. (2008) Paediatric Blood and Cancer, 51: 689-691. El Zaabi E., Fernandez L., , Riddell, DC., and Greer, WL., MPLA vs FISH in the detection of prognostic markers in Chronic Lymphoblastic Leukemia. (2010), J of Mol Diag, 12: 197-203. Soulieres D., Greer, W., Magliocco A., Huntsman D., Young., Tsao M-S., and Kamel-Reid S. KRAS mutation testing in the treatment of metastatic colorectal cancer with anti-EGFR therapies. (2010) Current Oncology, 17: 31-40. Renault NK, Howell RE, Robinson KS, Greer WL. Qualitative assessment of the emotional and behavioural responses of haemophilia A carriers to negative experiences in their medical care. Haemophilia 2011; 17, 237-245. Renault NK, Renault MP, Copeland E, Howell RE, Greer WL. Familial skewed X-chromosome inactivation linked to a component of the cohesion complex, SA2. Journal of Human Genetics 2011; 56, 390-397. Renault NK, Pritchett SM, Howell R, Greer, WL, KH Ørstavik KH, Sapienza C, Hamilton DC. Statistical Evidence for the Genetic Control of X-chromosome Inactivation Choice in Human's. 2013; Eur J Hum Genet 21: 1396-1402.
van der Hoeven, D., Flaman, A.S., Chew, J.S.K., McDonald, L., Greer, W.L. and Dobson, M.J. (2012). The yeast Niemann-Pick C-related gene (NCR1) encodes a vacuolar membrane protein required for efficient endocytic trafficking. Submitted to J. Cell Science. Jean-Claude Cutz, Kenneth J. Craddock, Emina Torlakovic, Guilherme Brandao, Ronald F. Carter, Gilbert Bigras, Jean Deschenes, Iyare Izevbaye, Zhaolin Xu, Wenda Greer, Yasushi Yatabe, Diana Ionescu, Aly Karsan, Sungmi Jung, Richard F. Fraser, Miriam Blumenkrantz, Josee Lavoie, Flechere Fortin Anna Bojarski, MD, Gilbert B. Côté, A. van den Berghe, Fariborz Rashid-Kolvear, Martin Trotter, Harmanjatinder S. Sekhon, Roula Albadine, Danh Tran-Thanh, Isabelle Gorska, ,14 Ben Blencowe, John Iafrate, David M. Hwang, Melania Pintilie, Rania GaspoChristian Couture, and Ming Sound Tsao., Canadian Anaplastic Lymphoma Kinase (ALK) study: A model for multi-centre standardization and optimization of ALK testing in lung cancer. 2014; J Thor Oncol. 9: 1255-1263. Daniel Gaston, Samantha Hansford, Carla Oliveira, Mathew Nightingale, Hugo Pinheiro, Christine Macgillivray, Pardeep Kaurah, Andrea L. Rideout, Patricia Steele, Gabriela Soares, Weei-Yuarn Huang, Scott Whitehouse, Sarah Blowers, Marissa A. LeBlanc, Haiyan Jiang, Wenda Greer, Mark E. Samuels, Andrew Orr, Conrad V. Fernandez, Jacek Majewski, Mark Ludman, Sarah Dyack, Lynette S. Penney, Christopher R. McMaster, David Huntsman, Karen Bedard. Germline mutations in MAP3K6 are associated with familial gastric cancer. 2014; PLoS Genetics, 10:1371. Noha Botros, Lorenzo Cerroni, Allam Shawwa, Peter Green, Wenda Greer, Silvia Pasternak, Noreen Walsh. Cutaneous manifestations of angioimmunoblastic T-Cell lymphoma: clinical and pathological characteristics. 2015; Am J Dermatopath 37: 274-283. Wenda Greer, Susan Douglas, Zhaolin Xu, Wojciech Morzycki, Mary MacNeil, Andy Stone and Drew Bethune. 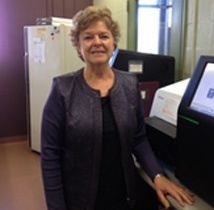 Molecular diagnostics for lung cancer in Atlantic Canada. 2015, Can J Pathol., 7:20.